Would Aurora have a product to clean the carpets for a 17 foot bowrider? There is a buildup of green musty and moldy residue on the carpets. Any suggestions regarding this matter. Would a carpet cleaner with a cleaning solution do the trick or would I be able to scrub it out with a brush and a solution? 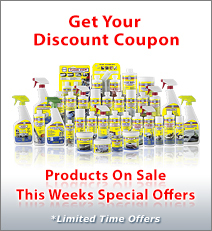 Aurora Boat Clean Plus will do a better job of cleaning boat carpet than professional steam cleaning. If it’s a snap in carpet, remove it and clean it on the dock, driveway or on a lawn. 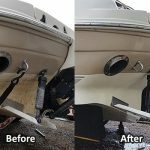 If it’s permanently attached, you can clean it in the boat. Pre-spot clean the carpet. 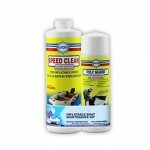 In other words, spray straight Boat Clean Plus on any stains, heavy soiling, mould or mildew. Wet the carpet with a garden hose. Spray Boat Clean Plus evenly over the carpet. Use a deck brush or stiff bristled scrub brush and give the carpet a good scrubbing in all directions, paying special attention to the stained or heavy soiled areas. You should see foam from the brushing. 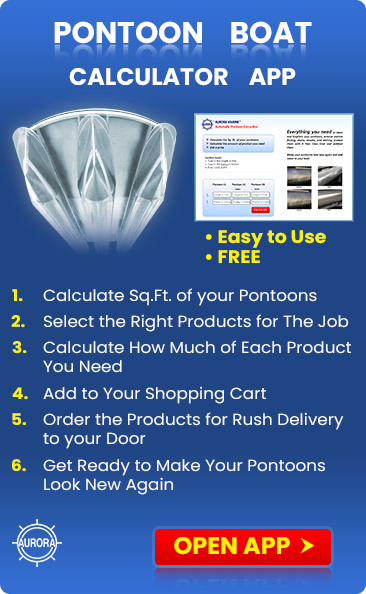 That indicates that you have enough Boat Clean Plus on the surface. If not, spray some more. If you are getting heavy foam, you are using too much. When dry, vacuum the carpet to fluff up the pile. 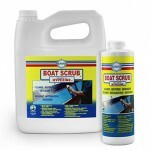 When the carpet is out of the boat, use Boat Scrub on the fiberglass to deep clean any remaining mould spores out of the pores in the gelcoat. Rinse, dry and apply 2 coats of Premium Boat Shine to seal the pores and protect the gelcoat against further damage or mould spore propagation. 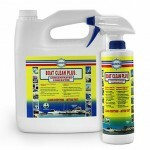 You can also use Boat Clean Plus to clean the vinyl seats.